I love to cook, but it is hard for me to actually cook when I could eat free dinners at my boyfriend's workplace everyday. Saturday is binge day. Therefore, Sunday is when I cook for us, and for lunch for the week. Pad Thai is one of my favorite noodle dishes. I heard that people on Primal/Paleo/Zone sub noodles for Kelp Noodles or some type of squash. For this recipe I used zucchinis and yellow squash for the "noodles" and almond butter for peanuts and to my surprise, it tasted as great as the real deal! This recipe will yield approximately 6-8 servings. I made this for dinner last Sunday night and took the leftovers to work for lunch. It was all gone by Wednesday. Feel free to change the portion sizes of any ingredient and add/remove vegetables. The beauty of cooking Asian dishes is that you're dish will probably still taste awesome without using exact measurements. Most ingredients can go in the pot at any time, so you can adjust whenever you want. Use a Mandoline Slicer to slice the zucchinis and squash, lengthwise. Drain as much water as possible, or your pad thai is going to come out kind of watery. I used paper towels. Set aside. 3. 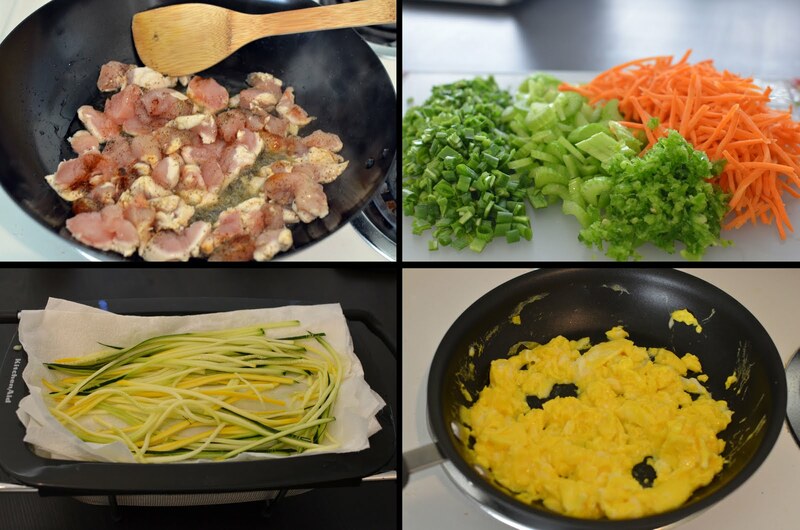 Clockwise: Cook chicken in spices and coconut oil, chopped vegetables, partially cooked eggs, use paper towels to help drain water out of squashes. Melt the coconut oil over medium heat in the wok. Fully cook the chicken. Add chili powder, crushed red peppers, salt, pepper, and any other spices you desire at this time. Remove chicken from wok and put aside. Keep the grease. Scoop out some of the remaining grease from the wok and put it in the frying pan. You can add Coconut Aminos to the eggs if you want. Only partially cook the eggs. Remove eggs and put aside. Add the red onions, garlic, and ginger to the wok and sautee over medium heat until onions are cooked. Add the almond butter, lime juice, and chicken broth to create the paste. Cook for 3 minutes. Keep stirring so the almond butter does not stick to the pan. Add the sliced zucchinis, squash, and carrots to the wok. Cook until the "noodles" are partially cooked. Don't worry the "noodles" will shrink a bit. Add the celery, jalapenos, green onions, and leeks. Cook for 3-5 minutes. Add the eggs and chicken. Cook for 5-10 minutes. Serve and enjoy! You can add chopped almonds to sprinkle on top if you like.